However, the latest evidence would have it that myopia is in fact, not inherited! Myopia is generally not inherited, but acquired due to bad visual habits. You can reverse the changes of myopia by changing these habits and performing specific eye exercises for myopia. Many people are misinformed about myopia, and eye doctors have an interest in preserving this inaccurate information. Why? Because if myopia were inherited, the only way you could treat it is via surgery, or by wearing glasses for the rest of your life. Both options are expensive, given that people with myopia commonly need stronger and stronger prescriptions over time. Statistics show that a very small percentage (approximately 2%) of the population is born with the eye deformation that causes myopia, or nearsightedness. Depending on where you are in the world, the prevalence of myopia in adults ranges from 25% to a huge 80%. These figures are also growing over time. In a study in 1971-1972 in the United States, 25% of the population were found to be myopic. In another study using the same method in 1999-2004, the prevalence of myopia climbed to 41%! Now we know for a fact that our genes don’t change so quickly. The theory of evolution would suggest that it takes millions of years for even the slightest genetic change to occur. It is now widely accepted that environmental factors play a huge role in deciding whether or not we develop myopia. Sure, you might have a genetic predisposition toward developing myopia, which is why myopia IS often seen to run in families, but there is also a strong environmental component that decides whether or not you will develop myopia, a component that puts YOU in control. Myopia occurs due to an abnormal lengthening of the eye-ball. Because the eyeball is longer than it should be, the image is not formed on the retina, but in front of it, and that causes people to experience blurred vision. People with myopia usually see close objects, but cannot see distant ones. Research has shown that several factors could lead to the development of myopia. When people force their eyes to look at close objects continuously (the screen of the computer or the TV, a notebook, book, etc. ), their eyes slowly lose their flexibility and become “specialized” in close vision. Many schoolchildren are diagnosed with myopia, and education has a huge role to play in this. Children spend 6-7 hours in school, writing in their notebooks or reading from their books, and then return home and spend another 4 hours playing computer games or watching TV. The fact that their vision becomes impaired is not unexpected. If you can acquire myopia through bad visual habits, then it means your eyes have a certain level of plasticity. And if your eyes can change, and your vision can worsen, it means it can also change for the better. In other words, myopia can be reversed. Understanding what causes myopia can help us to understand what could reduce myopia or treat it completely. If bad habits are to blame for the development of myopia, then correcting these habits and replacing them with healthy habits can reverse all the damage that has been done. Because myopia is caused by a lack of variety in the activity of the eyes, increasing variety can be the way to healing myopia. And this can be done by practicing eye exercises for myopia. 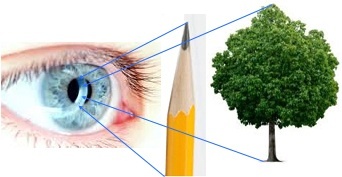 The eye exercises for myopia are based on the principle of shifting from near to distant vision. When we stop looking at near objects, and force them to look at distant objects as well, we actually train our eyes, and teach them to see objects in the distance better. This conclusion has been tested in many experiments, carried out by eye specialists and researchers from all over the world. Many of the published works on this topic provide significant evidence that myopia can be reversed, and myopia eye exercises are particularly efficient in doing so. Many of the participants in these experiments showed impressive improvements in their visual acuity after a period of eye training that included different types of eye exercises for myopia. Though it is possible to achieve perfect 20/20 vision, the least that will happen is your eyesight will improve, and you will go from needing stronger glasses over time to needing weaker ones. Choose an object that is positioned near you. You can use one of your fingers. Hold the object at about 6 inches from your nose, and look at it for 5 seconds. Then, choose a distant object that is positioned at least 6 m away from you. Change your focus to the distant object and hold for another 5 seconds, then return to the near object. Repeat this continually for a few minutes. If you work for long hours staring at a computer screen, book, or something else nearby, take a short 10 minute break and relax your eyes by looking at a distant object. You can look at a tree you see out the window, or a building. Try to look at every detail of the object, while being careful not to strain. As long as you’re not trying too hard to see clearly, you may realize that less strain is required to look at distant objects than it is to look at an object that is right in front of your eyes. This lack of strain helps to relax your eye muscles. Eye strain can sometimes manifest as pain around your eyes, or it can result in a headache, but usually it goes completely unnoticed and manifests instead as poor vision. Dealing with eye strain by relaxing your eye muscles with this exercise is a very important step toward treating myopia. If you would like to learn more about these and other eye exercises for myopia, I highly suggest you read this post on how to improve eyesight naturally. How I Reversed My Diabetic Kidney Disease & Completely Avoided the Pain, Discomfort & Expense That Accompany Dialysis & Kidney Transplant Surgery! The 10-Minute Guide to Better Eyesight without Glasses!